Base Notes: sandalwood, patchouli, vanilla 'A Rose For…’ is unique to the possessor, signifying the personal attachment to scent. Defined by no one, it is truly for you. The fragrance is accompanied by the addition of a gold pen, allowing each owner to complete the individual naming of their scent. An oriental rose of striking beauty, inspired by the affiliation of intense fragility yet powerful scent within the flower. Contemporary and dark with a confident, complex character that places the rose with notes of spice, orris and woods, taking the wearer on an altogether diverse journey of romance. The main character of the fragrance is carried in the heart where the floral balance of red rose is delicately wrapped in incense, oud and orris. Characteristic warm woody notes of patchouli, sandalwood and amber in the base give the fragrance strength, refinement and depth. Beautifully boxed; 100ml / 3.4 fl oz natural spray. Made in England. 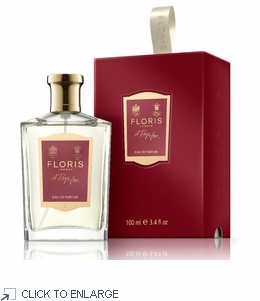 Following a visit to the rose fields of Morocco in 2015, Edward Bodenham was intrigued by how the rose has the ability to interpret the identity of its natural origin and so sought to explore this classic Floris perfumer note in an altogether different environment of warmth, ardour and elegant beauty. Contemporary And Dark With A Confident, Complex Character. 'A Rose For…’ is unique to the possessor, signifying the personal attachment to scent. Defined by no one, it is truly for you. Beautifully boxed; 100ml / 3.4 fl oz natural spray.